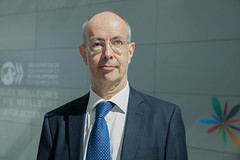 Ambassador Jean-Joël Schittecatte took up his duties as Permanent Representative of Belgium to the OECD on 2 September 2015. Mr. Schittecatte was born in Lausanne on 15 September 1955, he holds a degree in law from the University of Brussels. Mr. Schittecatte joined the diplomatic service in 1986 after having gained work experience in the government (team of the Minister of Education, later with the team of the Minister for Brussels Region), in the private sector (Insurances), and in the Ministry of Foreign Affairs. He held several important positions within the Ministry of Foreign Affairs: from 1988 to 1992 Mr. Schittecatte was assigned to the Economic and Commercial section of the Belgian Embassy in Paris ; from 1992 to 1995 he worked in the Africa service of the Ministry of Foreign Affairs in Brussels where he followed the economic and commercial aspects of the relations between Belgium and the African continent; from 1995 to 2000 he was Deputy Permanent Representative of Belgium to the Organisation for Security and Cooperation in Europe, more specifically in charge of military and security issues. In 2000 he joined the Permanent Representation of Belgium to the European Union as Counsellor for the internal market (responsible for issues of free movement, intellectual property and public procurement) and from 2004 to 2007 he served as was Diplomatic Advisor of the State Secretary for European Affairs. From 2007 to 2014, Mr. Schittecatte was nominated respectively Consul General of Belgium in Mumbai - India, then in Istanbul - Turkey, and subsequently Diplomatic Advisor and Deputy Head Office of the Prime Minister of Belgium. In January 2012, he was appointed Diplomatic Advisor and Deputy Director of the Office of the Prime Minister of Belgium. From October 2014 until his appointment as Permanent Representative of Belgium to the OECD in 2015, Mr. Schittecatte served as Director “Neighbouring Countries” at the Ministry of Foreign Affairs, Brussels.